Table-Linen, etc.–Table-cloths of white damask, double or single, as fine as the owner’s purse admits, are used for the dinner-table, with large square white napkins to correspond. The table should first be covered with a mat of double-faced cotton flannel wide enough to fall six inches below the edge of the table, all around. This under mat greatly improves the appearance of the table-cloth, which can be laid much more smoothly over this soft foundation. Besides, the mat protects the table from too close contact with hot dishes. Small table mats for the purpose of protecting the cloth are not fashionable at present, though many careful housekeepers retain them rather than risk injury to fine table linen. Carving-cloths are used when carving is done at the table, but are not needed when dinner is served à la Russe. Napkin rings are discarded by many who hold that a napkin should be used but once, and must be re-laundried before reappearing on the table. Practically, such a fastidious use of table linen would exhaust most linen supplies, and overcrowd the laundry. The neat use of a napkin renders this extreme nicety superfluous as a rule of home dining, Care should certainly be taken to remove all soiled table linen. Nothing is more disgusting than a dirty napkin, but the snowy linen that comes spotless through one using may, with propriety, be retained in the ring to be used several times. This, of course, refers to every-day dining at home. On formal occasions no napkin rings appear on the table; the napkins are always fresh, and used for that time only. At the close of the dinner they are left carelessly on the table; not rolled or folded in any orderly shape. Small fringed napkins of different colors are used with a dessert of fruits. Fancy doylies of fine linen embroidered with silk are sometimes brought in with the finger-bowls; but these are not for utility, the dinner napkin doing service, while the embroidered “fancy” adds a dainty bit of effect to the table decoration. China, Glassware, Cutlery, Silverware, etc.–Chinaware for the dinner service should be of good quality. Fashions in china decoration are not fixed; the fancy of the hour is constantly changing, but a matched set is eminently proper for the dinner table, leaving the “harlequin” china for luncheons and teas. Artistic glassware is a very handsome feature of table furnishing. Carafes and goblets for water are always needed at dinner; wine glasses, possibly; and the serving of fruits and bon-bons gives opportunity to display the most brilliant cut-glass, or its comparatively inexpensive substitutes, which are scarcely less pretty in effect. Fine glass is infinitely more elegant than common plated-ware, and though more liable to breakage is less trouble to keep in order. The best dinner-knife is of steel, of good quality, with handle of ivory, ebony, or silver. Silver-plated knives are much used; they do not discolor so readily as steel, and are easily kept polished. They answer the purpose for luncheon, but they rarely have edge enough to be really serviceable at dinner or breakfast. The condiments are left on the sideboard, and handed from there in case any dish requires them, the supposition being that, as a rule, the several dishes are properly seasoned before they are served. Individual salt-cellars are placed on the table, and may be accompanied with salt spoons; if these are omitted, it is understood that the salt-cellar is emptied and refilled each time that it is used. On the family dinner-table the condiment line is not so severely drawn; vinegar in cut-glass cruets, mustard in Satsuma pots, and individual “peppers”–in silver, china, or glass, and of quaint designs–are convenient and allowable. A table covered with white damask, overlaid with sparkling china and cut-glass, and reflecting the white light of polished silver, is a pretty but lifeless sight. Add one magic touch–the centre-piece of flowers–and the crystallized beauty wakes to organic life. In arranging the modern dinner-table, when the service is to be à la Russe, floral decorations are almost indispensable. Without something attractive for the eye to rest upon, the desert stretch of linen looks like the white ghost of famine mocking the feast. The shape of the table, the available space, and the nature of the occasion decide the quantity and distribution of the flowers. It is a matter in which wide latitude is given to individual taste and ingenuity, original designs and odd conceits being always in order, subject only to the law of appropriateness. For a square or extra wide table a large centre-piece, either round or oblong, is usually chosen, with endless varieties in its component arrangement. In early autumn, in country homes or in suburban villas, nothing is more effective than masses of golden-rod and purple asters, gathered by the hostess or her guests during their afternoon drive, and all the more satisfactory because of the pleasure taken in their impromptu arrangement. Wild flowers should be neatly trimmed and symmetrically grouped to avoid a ragged or weedy appearance. The mat is first adjusted upon the table, and the table-cloth smoothly and evenly laid over it. The cloth should fall about half-way to the floor all around. The floral accessories are then put in place. Carafes containing iced water are placed here and there on the table, at convenient points. The next step is the laying of the covers; a cover signifying the place prepared for one person. 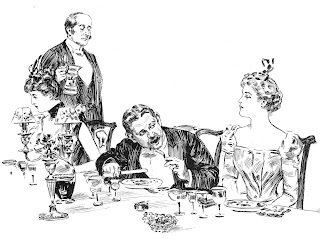 For a dinner in courses a cover consists of a small plate (on which to set the oyster plate), two large knives, three large forks (for the roast, the game, and entrées), one small knife and fork (for the fish), one tablespoon (for the soup), one oyster-fork. The knives and forks are laid at the right and left of the plate, the oyster-fork and the spoon being conveniently to hand. A glass goblet for water is set at the right, about eight inches from the edge of the table; if wine is to be served the requisite glasses are grouped about the water goblet. The napkin is folded square, with one fold turned back to inclose a thick piece of bread; or, the napkin may be folded into a triangle that will stand upright, holding the bread within its folds. This is the only way in which bread is put on the dinner-table, though a plate of bread is on the sideboard to be handed to those who require a second piece. It is entirely proper to ask for it, when desired. Butter is not usually placed on the dinner-table, but is handed from the sideboard if the menu includes dishes that require it; as, sweet corn, sweet potatoes, etc. Small butter-plates are included in the “cover” in such cases. The oysters, which form the initial course, are usually on the table before the guests take their places. A majolica plate, containing four or six of the bivalves with a bit of lemon in the midst, is placed at each cover; or, oyster cocktails may be served. The soup tureen and plates are brought in to the side table. All is now in readiness. While these preparations have been going on in the dining-room, the guests have been assembling in the drawing-room. 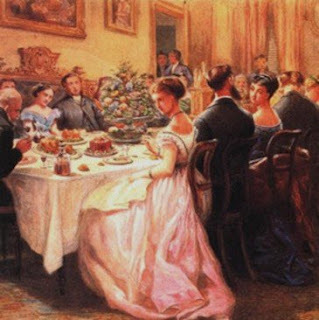 It is proper to arrive from five to fifteen minutes before the hour mentioned in the invitation, allowing time to pay respects to the host and hostess, without haste of manner, before the dinner is announced. A gentleman wears a dress suit at dinner. A lady wears a handsome gown, “dinner dress” being “full dress;” differing, however, from the evening party or reception gown in the kind of fabrics used. The most filmy gauzes are suitable for a ball costume; while dinner dress–for any but very young ladies–is usually of more substantial materials–rich silk or velvet softened in effect with choice lace, or made brilliant with jet trimmings. Each gentleman finds in the hall, as he enters, a card bearing his name and the name of the lady whom he is to take out; also, a small boutonnière, which he pins on his coat. If the lady is a stranger, he asks to be presented to her, and establishes an easy conversation before moving toward the dining-room. When dinner is ready the fact is made known to the hostess by the butler, or maid-servant, who comes to the door and quietly says “Dinner is served.” A bell is never rung for dinner, nor for any other formal meal. The host leads the way, taking out the lady who is given the place of first consideration; the most distinguished woman, the greatest stranger, the most elderly–whatever the basis of distinction. Other couples follow in the order assigned to them, each gentleman seating the lady on his right. The hostess comes last, with the most distinguished male guest. If there is a footman, or more than one, the chairs are deftly placed for each guest; but if only a maid is in waiting, each gentleman arranges his own and his partner’s chairs as quietly as possible. As soon as the company are seated, each one removes the bread; and the napkin, partially unfolded, is laid across the lap. It is not tucked in at the neck or the vest front, or otherwise disposed as a feeding-bib. It is a towel, for wiping the lips and fingers in emergencies, but should be used unobtrusively–not flourished like a flag of truce. The servant is ready to hand from the side-board any condiments desired for the oysters, which are promptly disposed of. It may be remarked at the outset, that everything at table is handed at the left, except wine, which is offered at the right. Ladies are served first. After the oyster-plates are removed, the soup is served from the side table–a half ladleful to each plate being considered the correct quantity. You must accept it (whether you eat it or merely pretend to), but you must not ask for a second helping, since to do so would prolong a course that is merely an “appetizer” preparatory to the substantials. The soup-plates are removed, and the fish immediately appears, served on plates with mashed potatoes or salad, or sometimes both, in which case a separate dish is provided for the salad. The entrées follow the fish, hot plates being provided, as required. Dishes containing the entrées should have a large spoon and fork laid upon them, and should be held low, so that the guest may help himself easily. Again the dishes are removed. The roast is the next course. The carving is done at the side table. Guests are consulted as to their preference for “rare” or “well-done;” and the meat, in thin slices, is served on hot plates, with vegetables at discretion on the same plate, separate vegetable dishes–except for salads–not being used on private dinner tables. Certain vegetables, as sweet corn on the cob, may be regarded as a course by themselves, being too clumsy to be disposed of conveniently on a plate with other things. The game course is next in order (if it is included, as it generally is in an elaborate dinner). Celery is an appropriate accompaniment of the game course. The salad is sometimes served with the game; otherwise it follows as a course by itself. The salad marks the end of the heavy courses. The crumb tray is brought, and the table-cloth is cleared of all stray fragments. A rolled napkin makes a quiet brush for this purpose, especially on a finely polished damask cloth. The dessert is now in order. Finger-bowls and doylies are brought in on the dessert-plates. Each person at once removes the bowl and doyley to make ready for whatever is to be put on the plate. Ices, sweets (pastry and confections), cheese, follow in course; and, finally, the fruits and bon-bons. Strong coffee is served last of all, in small cups. Fashion decrees café noir, and few lovers of cream care to rebel on so formal an occasion as a dinner; but when the formality is not too rigid, the little cream jug may be smuggled in for those who prefer café au lait. Water is the staple drink of the American dinner-table. A palatable table water, like Apollinaris, well iced, is an elegant substitute for wine when habit or conscience forbids the latter. When wine is served with the different courses at dinner, the appropriate use is as follows: with soup, sherry; with the fish, chablis, hock, or sauterne; with the roast, claret and champagne; after the game course, Madeira and port; with the dessert, sherry, claret, or Burgundy. After dinner are served champagne and other sparkling wines, just off the ice, and served without decanting, a napkin being wrapped around the wet bottle. 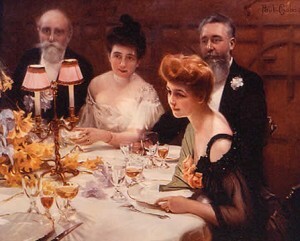 While wine may be accounted indispensable by many, the growing sentiment in favor of its total banishment from the dinner-table has this effect on the etiquette of the case, that the neglect to provide wine for even a very formal dinner is not now the breach of good form which it would have been held to be some years ago. It is good form for a host to serve or not serve wine, as he chooses; it is very bad form for his guest to comment on his choice. When any one who is conscientiously opposed to wine-drinking, or for any reason abstains, is present at a dinner where wine is served, he declines it by simply laying his hand on the rim of his glass as the butler approaches. No words are necessary. Extra knives and forks are brought in with any course that requires them. The knife is held in hand as little as possible, being used only when cutting is actually necessary, the fork easily separating most vegetables, etc. In the fish course, however, the knife is used to assist in removing the troublesome small bones. In holding the knife the fingers should not touch the blade, except that the forefinger rests upon the upper edge not far below the shank when the cutting requires some firmness of pressure. The dinner knife should be sharp enough to perform its office without too much muscular effort, or the possible accident of a duck’s wing flying unexpectedly “from cover” under the ill-directed stress of a despairing carver’s hand. The fork is held with the tines curving downward, that position giving greater security to the morsel, and is raised laterally, the points being turned, as it reaches the mouth, just enough to deposit the morsel between the slightly-parted lips. During this easy movement the elbow scarcely moves from its position at the side, a fact gratefully appreciated by one’s next neighbor. Liquids are sipped from the side of the spoon, without noise or suction. In serving vegetables the tablespoon is inserted laterally, not “point first.” Celery is held in the fingers, asparagus also, unless the stalks are too tender. Green corn may be eaten from the cob, a good set of natural teeth being the prime requisite. The management of fruits in the dessert is another test of dainty skill. Oranges may be eaten in different ways. Very juicy fruit may be cut in halves across the sections and scooped out with a spoon. The drier “seedless” oranges are better peeled and separated. With a fruit knife, remove the tough skin of each peg, leaving enough dry fiber to hold it by, in conveying it to the mouth. Practice enables one easily to “make way with” an orange. Bananas are cut in two, the skin removed; the fruit is held in the fingers, or–preferably–eaten with a fork. Juicy pears and peaches may be managed in the same way, at discretion, the rule being that the fingers should touch as little as possible fruits that are decidedly mushy. The finger-bowl stands ready to repair all damages of the nature suggested. The fingers are dipped in the water and gently rinsed, and then passed lightly over the lips, and both mouth and fingers are wiped upon the napkin. At a signal from the hostess, the ladies rise and return to the drawing-room. The gentlemen follow immediately, or remain a short time for another glass of wine, when such is the provision of the host. The conversation at the dinner-table should be general, unless the company is large, and the table too long to admit of it. But in any case, each one is responsible first of all for keeping up a pleasant chat with his or her partner, and not allowing that one to be neglected while attention is riveted on some aggressively brilliant talker at the other end of the table. No matter how uninteresting one’s partner may be, one must be thoughtful and entertaining; and such kind attention may win the life-long gratitude of a timid débutante, or the equally unsophisticated country cousin. 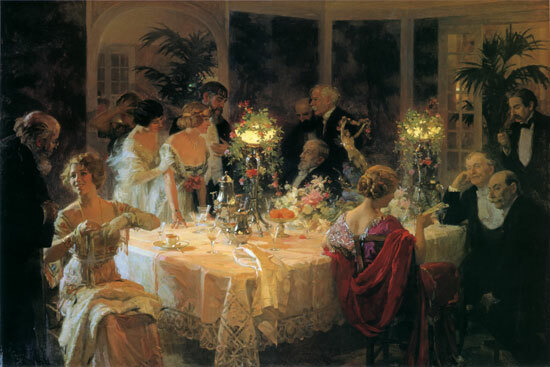 The informal dinner, daily served in thousands of refined American homes, is a much less pretentious affair than the name “dinner” technically implies. In most cases the service is but partially à la Russe, most courses, and all the entrées, being set on the table, the serving and “helping” being done by some member of the family; the presence of a waitress being sometimes dispensed with except at transition points; as, when the table is cleared before the dessert. This formality is the most decided dinner feature of the meal, which throughout its progress has been conducted more like a luncheon. Yet, in all essential points of mannerliness, the family dinner is governed by the same rules that control the formal banquet. At the informal dinner it is customary to seat the guests in the order in which they enter the dining-room, without assigning any place of distinction; all the places at table being held of equal honor–comfort and convenience being the things chiefly considered.